While this shrub blooms, it’s the lush spoon-shaped foliage that makes it such a beautiful shrub in the landscape. 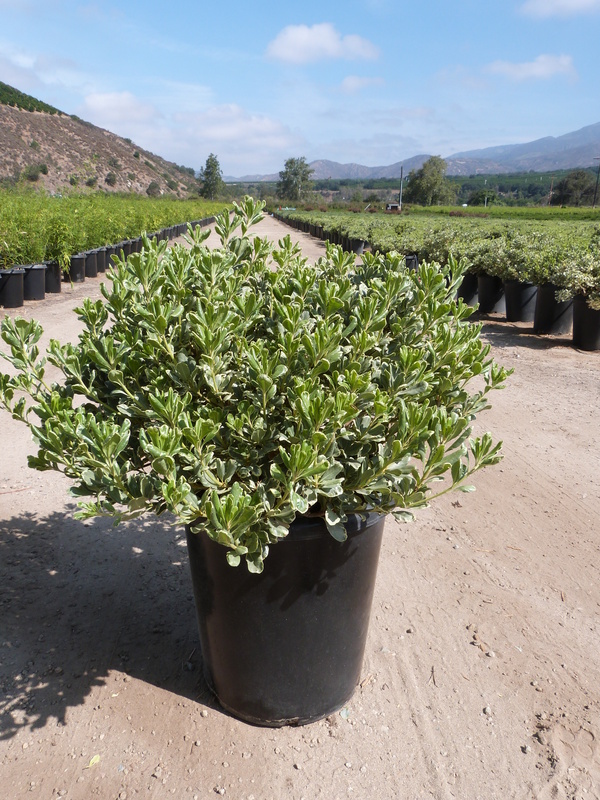 Pittosporum tobira ‘variegata’ produces 2- to 5-inch long green leaves with white edges. In spring, plants produce small white, fragrant flowers, followed by inconspicuous hard fruits. Plants grow into a natural rounded shape that works as an evergreen focal point or a no-shear hedge. Pittosporum is a very low maintenance shrub that tolerates many different soil conditions, including seaside locations. To promote thick growth, fertilize spring and fall. When watered regularly, foliage grows very dense. Tip-prune plants to keep them to the desired size, or allow to grow to its full size and natural form if space allows. Pittosporum is best grown in shady locations, or dappled sun, as foliage can scorch in hot afternoon sun.